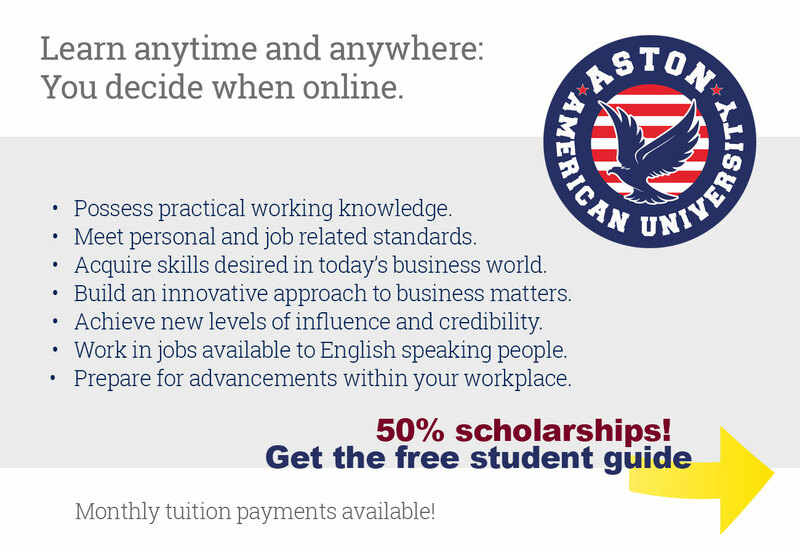 If your goal is to empower yourself to meet the growing expectations of today’s business world, let Aston American University help inspire you. Motivating yourself to support your aspirations may be the best investment you can make for the future you envision. Imagine utilizing the most effective business principles at your workplace. Prepare for advancements as you gain newly acquired marketable skills, stronger business communication, and critical thinking capabilities. Are you ready to apply effective real-world application with your current experience? Be ready to showcase your leadership potential and passion to succeed. Certificate courses are instructed by highly educated and qualified instructors who hold doctoral and master’s level degrees. Their corporate business experience will be an asset to you because Aston American University instructors will also provide mentorship. By taking the next step to improve your understanding of business with Aston American University, you’ll be on your way to applying real-world business concepts, contributing to the world around you. Explore the foundations of launching a new business and gain insights that entrepreneurs must face when developing a new business opportunity. Learn to strategically communicate the value proposition of a business’s products and services to consumers or other businesses to ensure economic viability. Analyze the act of efficiently allocating resources to accomplish desired goals and objectives. Examine the role of financial managers and the financial market environment in which firms operate. Explore the art of managing all the aspects of a project from inception to closure using a scientific and structured methodology. Examine the imparting and exchanging of information to a diverse audience. Understand the essential roles and functions of effectively managing people within an organization. The certificate program is on a rolling admission and students may apply at any time. Courses are based on a flexible and self-learning structure to accommodate each student’s business and personal responsibilities. Students are required to pass a final examination at the end of each course. A minimum score of 70% on the final examination is needed in order to successfully pass the course. The e-learning system is an online educational management system with tailored course materials where students and lecturers interact. Course materials include presentations, readings, videos, assignments, quizzes, and a final exam. Following enrollment, a unique username and password will be issued for each student to access the e-learning platform. Students of Aston American University may login the system with their username and password. - Tuition ranges from $1,750 to $2,400.